Joseph Mallozzi's Weblog: April 8, 2010: Smells like hippie! The joys of writing! Pics! April 8, 2010: Smells like hippie! The joys of writing! Pics! The first thing my writing partner Paul said when I walked by him this morning was: “Somebody’s got a healthy vegan glow about him!”. In fact, it wasn’t a healthy vegan glow. It was much, much worse! As Ashleigh informed me, we hadn’t eaten vegan after all. We’d actually gone to a raw food restaurant! So, after last night’s experience, I’d say vegetarianism is to veganism is to raw food dining as lobotomizing is to trepanning is to cracking someone’s skull with a hammer blow to get them to shut the hell up. For his part, Carl was complaining about the peculiar lingering odor coming off his backpack. “It’s that hippie stench!”he cried. “That’ll never come off!” Apparently, Carl’s hippie-issues stem from an emotionally-scarring incident in his youth that saw him denied the opportunity to celebrate his tenth birthday at Disneyland because a bunch of hippies had taken over Tom Sawyer Island, forcing the park’s closure. It explains a lot. Excruciatingly slow going on the script front. Still stuck early in Act I, spinning my creative wheels in frustration. It’s times like these I regret not having pursued my childhood dream of being a detective. If I was offered ten million dollars never to write again, I would gladly take the deal. As a matter of fact, make me an offer before I have to complete this latest script, and I’ll settle for 7.5 million. Come on, haters! Put your money where your mouths are! Remi Aubuchon doesn’t have 7.5 million to spare but kindly offered to kill me and thereby obviate my need to finish the script. I turned down the offer. Paul suspects that a week from now, when I’m agonizing over Act III, I’ll come to regret my rash decision. 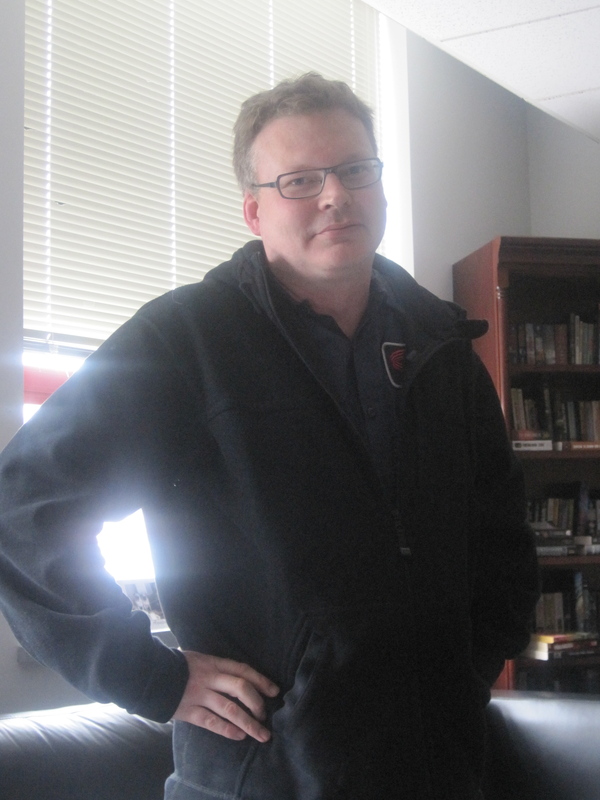 Patrick Gilmore, SGU's Dale Volker, looking very Mad Professor. 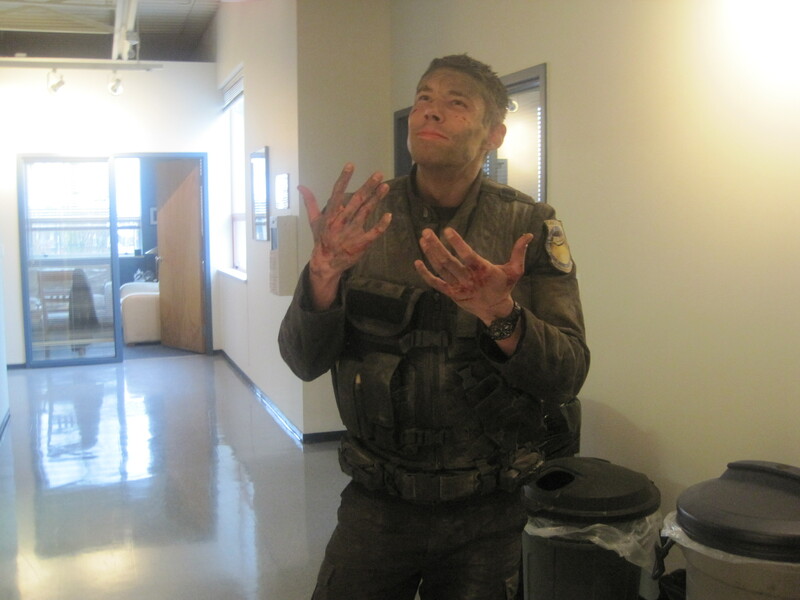 Brian J. Smith, SGU's Lieutenant Matthew Scott, wonders "How the heck did I get into this?". Super VFX Supervisor Mark Savela drops by to talk t.v. and how the visual effects in Awakening are going to blow away anything we've seen to date. 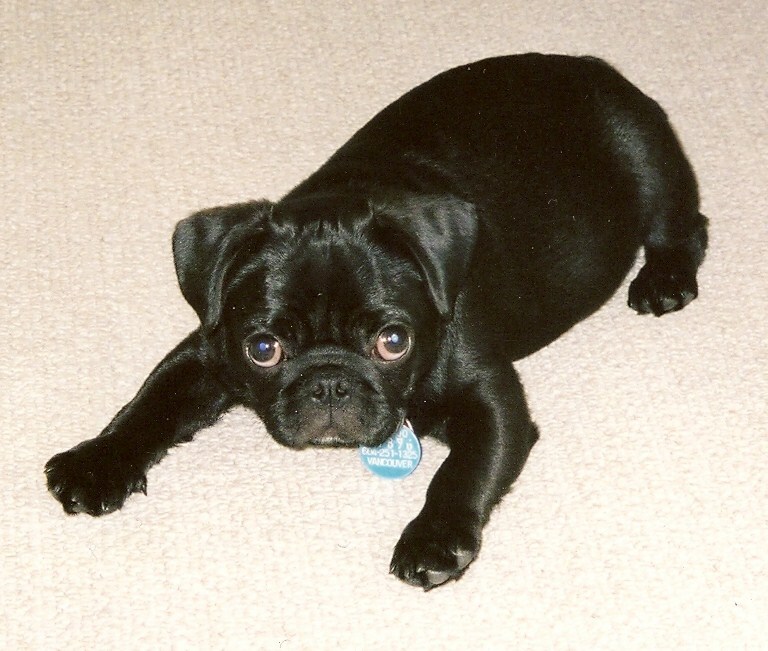 Compare to present-day Maximus (pictured in the blog banner). No wonder my mother refers to him as “salciccione” = big sausage. Previous Article April 7, 2010: Prep and Production Happenings! We go Vegan! Next Article April 9, 2010: That is one motherf***ing sinister-looking fridge! Ashleigh’s cookie caper! SGU’s Divided airs tonight! And a book of the month club reminder! I’m new to the commenting game, but I’ve been lurking for awhile. I really enjoy all the foodie posts. I had to post after seeing the picture of Maximus. So cute! How much older is he now? As an aside…I’ve watched all the different Stargates over the years and I love SGU. Space was an awesome episode. I love that you go out to eat with Ashleigh at least once a year! She forces you to broaden your foodie horizons! Oooh PICTURES!!!! SQUEE!!! Particularly the second! Looks like there’s some delicious Scott whumpage coming up!!! Either that or he’s rolling around in the dirt! And either way, I’m *very* excited about it! Ahhh…I was wondering about that restaurant (and the cold food). Yeah – raw foods are a bit…meh. Not all…but I’ve looked into it, and it’s not my cuppa. Some things just need to be sauteed in olive oil and garlic. Maximus is adorable! If only we all could stay svelte like we were in our younger days! Well…except you, Joe…you’re still svelte. Hubby, too. But that’s good – he doesn’t mind a little meat on my bones, and I love a skinny guy (rock star skinny, too…as in practically emaciated… though Mr. Das isn’t quite that thin. Wouldn’t mind if he was, though). Sooo…Carl is afeared of hippies?? I thought he WAS a hippie! NOW I totally understand his reaction to the skeevy thing…and I’m so very sorry. Deni….more hugs as you await information for your decision making. Just about every restaurant – high end or “hole in the wall” has something about their ventilation that seems to circulate all the air from the kitchen throughout the entire establishment. Thus, heavy coats and most clothes will have the aromas (good and bad) of the last restaurant. And, that is the issue…it may smell fine while you’re there, but the next day….could be eeuuwwwww….find the fabreeze! Sorry to hear Carl likely put his stuff on a table, chair, counter, or worse may have dropped on the floor to pick up the finer “fragrances” which he now cannot stand. You’re giving us even more reason not to go vegie. And, Maximus is just tooo cute and has the “muscles” to prove it. Hi Joe — raw food restaurants would never fly in the South — we cook EVERYTHING until it begs for mercy. Well Joe, I remember how much pain Space caused you and how much you strugled with writing it, and yet the episode still turned out to be utterly AWESOME! Don’t worry, you got it. Oh and thanks for pics of the gang! Keep the coming please!! I’m very frustrated. I work Friday nights, get home about 7:30 am to sleep and be back at the desk by 6:30 pm. Last weekend I insisted GeekBoy get up at 7:30 am Sunday when I got home so we could watch SGU before it was too late (and somebody spoiled me). The problem is I have to avoid Twitter and your blog, and threaten the SGU fans I know on Facebook, until I’ve watched the episode. That means I miss all the fresh discussions! 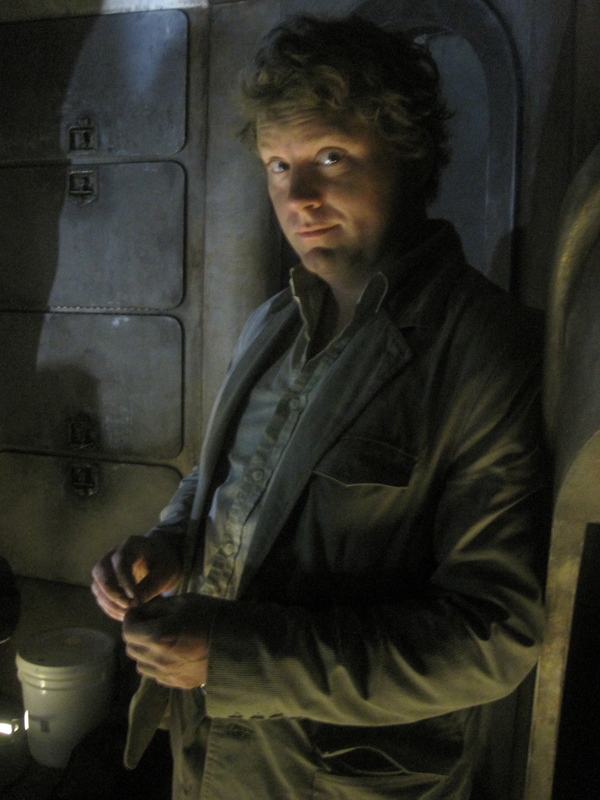 I’m thinking that this Saturday I’m waking everybody up to watch SGU right away, and then go to bed. How many more weeks of new eps do we have? I start day shift at the end of May, and then I can watch the show LIVE. Wow, even my vegetarian friends (some of whom have dabbled in veganry) agree the raw food scene is a little off. Maximus’ lovely photo reminded me of the subject I took into custody last night. http://www.twitpic.com/1e0b0t Just a tad bigger than Maximus, though. Hey, we have an opening, if you’re looking to escape your current drudgery! Salary and benefits, pepper spray and uniform provided. You just have to answer nonstop phone calls and listen to people lie to you. Sometimes you do actually get to help people, and as a bonus you get to babysit dogs who drool and/or pee on the carpet. Last night I got to do all of those things, so it was a good night. The lies are entertaining, helping people makes you feel good, and the dogs are sweet, even if they are a little smelly. Oh, you might need to rescue my last one from the spam folder, since it had a link in it. If you get a chance to do the mailbag please do these ones they have been burning for a while. (((Crazymom1))) Long time no see! Less than 17 hours until Chimaeracon opens. I, like a fool, volunteered to be first at venue at 10AM, have been assigned vendor booth layout and table setup. That’s what I get for telling people I’m available. So, I’ll probably not even lurk until Monday. Wishing Deni and her Elway all the best, and the same to all of you! I know adapt Atlantis to recharge using Sun Power so they can dial up Destiny and send them some backup and supplies at least once or once a year or so and for brief connections so they dont get used to it.At least send them some new clothes Col Youngs socks are already wearing out! @Deni Hang in there. We’re thinking of you. If you want an excuse not to write, a bunch of us will be in town on April 15th. Tell us where you will be at, oh, say, 5:30 PM and we will take you into Fan custody until the following Monday. How much do you think that Bridge Studios will pay so we can tell the cops that’s how much we want for you? What was your first clue there, Nancy Drew? That the warmest dish was just above body temp…? Lasagna without pasta noodles or cheese is blasphemy. At least the chocolate was good, though. Thanks for clarifying the shield bit! I never thought of it shutting off shield power but that makes so much more sense now. Oh Jesus. A RAW FOOD restaurant?! What the hell even is that? That’s not a restaurant; that’s just people taking the ingredients of food and tossing it onto some table in front of you. What kind of jackhole thought of that? Bunch of lazy jerks. See, nothing good ever comes out of a warehouse. Are you sure that that wasn’t just a warehouse full of raw food waiting to be shipped to a real restaurant, instead of…well, a raw food restaurant? Anyways, very cool to see the longer hair on Patrick Gilmore; it shows well the passage of time on Destiny and their lack of personal grooming devices. As for your script troubles, I’ll do one better: I’ll give you 10 bucks to let ME write your script for you! It might turn out to be a pile o’crap, but hey, 10 bucks can only get you so far. So, deal? @ Deni: Gotta say, I breathed a sigh of relief when I realized that I had misread your comment and thought you were going to put Elway down tomorrow, but it turned out that that was just preliminary. Phew. Hope everything goes well with the spleen surgery! I’ve got my fingers crossed Jonas style! @ annie from Fremantle: Haha! Thanks! I try. late question for Elyse Levesque. Are you ready for the annual Mallozzi chocolate bash this spring? Tell us where you’re stuck, give us an outline of what you have, and we’ll be more than happy to help you noodle it out. heh heh heh. Aw! Max is so cute. Look at that chubby little belly. Raw food restaurant? If I wanted that I could go to the park and nibble on the trees. Or, if I want variety go to my stepmom’s garden and enjoy a nice selection of nasty green, yellow, and red stuff. Then they charge you for the dubious privilege of trying to ingest that stuff? I’d say Ashleigh seriously owes you. Next time you think about a pig’s head dinner, or a foie gras feast I think she should have to partake. Well, as soon as I have the 10million to spare, I’ll make sure to send it your way. That should keep you working(I’d say at a real job, but I am not sure writing qualifies as real) for the next couple of decades at least. Thanks for the cool pics, though I think Brian Smith’s caption is off. When I saw it I immediately thought “Alas poor Yorick”, as he waits to catch the skull. Ah well. That explains why you’re the professional writer…. Barely recognized Maximus in that photo. Awwwwwwww… So cute. See? SEE!? What did I say about raw foods?! Tell Carl that the best way to remove hippie stench is to BURN the backpack. Second best is to rub it with bacon. Third best, start drinking heavily.